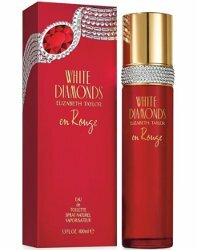 The Elizabeth Taylor brand has launched White Diamonds En Rouge, a new flanker to 1991's White Diamonds. Introducing the newest signature fragrance by Elizabeth Taylor, White Diamonds En Rouge. Designed to create an unforgettable entrance, the fragrance is a gift of bold glamor in a bottle. The notes feature pink pepper, raspberry, rose, jasmine, orange blossom, vanilla, vetiver, amber and patchouli. Elizabeth Taylor White Diamonds En Rouge is available now at Lord & Taylor, in 100 ml Eau de Toilette. Jumping on the red bottle bandwagon! J’adore ! So glamour perfume , bottle and box , so Elizabeth Taylor ! Just received this in the mail, and I’m very happy with my new purchase. I love ET perfumes, and since this in my favorite color, well I had to have it. This is very pretty. It is not overwhelming, and I don’t think anyone would find this offensive, or be put off by it. The sillage is not strong, but the lasting power is good. It does remind me of ELMM Le Rouge, but this is more sophisticated I believe. I can definitely smell the rose, this is the more prominent scent. I do smell some patchouli, but it is not strong. To me this is what red smells like. The bottle is just pretty! I think ET would be very proud of this scent, and I can picture her wearing this.